A friend introduced me to this Crockpot Rice Pudding, and it's been a family favorite ever since. Note: This is one of those dishes that tastes much better than it looks! Trust me! It takes only a couple of minutes to ready the ingredients for this pudding and put them into the slow cooker. Then just turn it on, and enjoy the delicious aroma that fills your kitchen for the rest of the day. 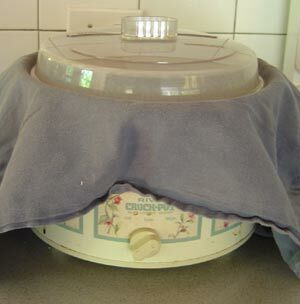 Place a clean tea towel under the lid of the slow cooker to absorb excess steam. I wasn't familiar with cardamom before I tried this recipe. I had to make a special trip to the store to find some. It's a delightful spice, with a unique sweet-yet-spicy flavor. Now that I've discovered it, I plan to learn how to use it in other dishes. Apparently it goes well with just about everything, from meats to vegetables to desserts! I used the ground form of the spice in this recipe and it tasted great - but the purists advise that you buy cardamom in its whole form and grind it at home. You could use a mortar and pestle, an electric grinder, or even your coffee grinder. Heat the milk over medium-high heat until it is almost boiling. Carefully pour the hot milk into the crockpot. Add the rice, raisins, sugar and cardamom. Stir gently until the sugar has dissolved. Place a tea towel on top of the cooker. Put the lid on top of the tea towel. Cook on HI for 3 hours. Use a non-dairy milk substitute (like soy milk or rice milk) in place of the milk. Use another type of rice. You'll need to watch closely, though, and give yourself extra time, because cooking time might be different. Experiment with using another sweetener instead of sugar. I haven't done so myself yet, because the pudding is just so good as it is! Try another dried fruit instead of - or as well as - the raisins. How about dried cranberries, or currants? Or use kitchen shears to cut dried apricot or mango into small pieces. Top each serving with some whipped cream - or pour milk or cream over each serving. Be very careful when removing the lid of the crock pot. There will be lots of steam. Remember: steam burns! Return from crockpot rice pudding to crockpot recipes.